It seems a little ironic writing this post for a Summer fruit drizzle cake when today has been decidedly autumnal. Yesterday we picked up some cheap strawberries and I decided after months of not having the time to bake anything it really was time to get back in the kitchen. The summer holidays used to be all about baking but these days they are all about play dates and keeping two energetic 18-month olds entertained! 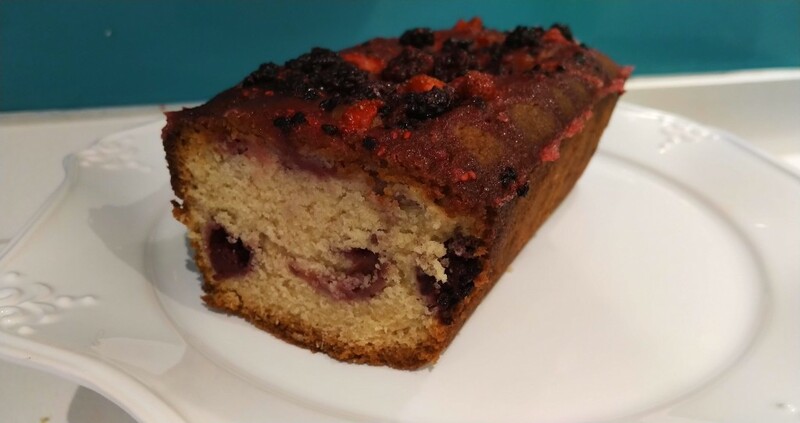 After a quick Google I did consider making this strawberry drizzle cake but had seen this BBC Good Food magazine recipe before and thought it be a good opportunity to use up some raspberries and blackberries that were in the freezer too. This is an easy recipe to make as you mix all the ingredients except the fruit in a bowl, mix and then layer with the fruit in a loaf tin. We’ve already had a slice this evening and it makes a lovely moist, sweet cake with a crunchy top. You’ll need a 2lb loaf tin. You can used any selection of fruit you want – the recipe on the BBC Good Food website also suggests using blueberries, redcurrants and blackcurrants, apricots, peaches, nectarines or plums. 1) Heat your oven to 180C/160C fan/Gas 4. Grease a 900g/2lb loaf tin and line the base and ends with a long strip of baking parchment. 2) Put the butter, caster sugar, flour, eggs and vanilla extract into a large bowl and beat with an electric hand mixer for 5 minutes until pale and creamy – the mixture will be very thick. 3) Spread one-third of the cake mix into the tin, then scatter over 50g of the fruit. Carefully dot and spread another third of the cake mix on top, and scatter with another 50g fruit. Finally dot the rest of the cake mix over and gently spread with the back of a spoon. 4) Bake for 1 hour until an inserted skewer comes out clean. 5) Once you’ve removed the cake from the oven, poke it all over with a skewer. 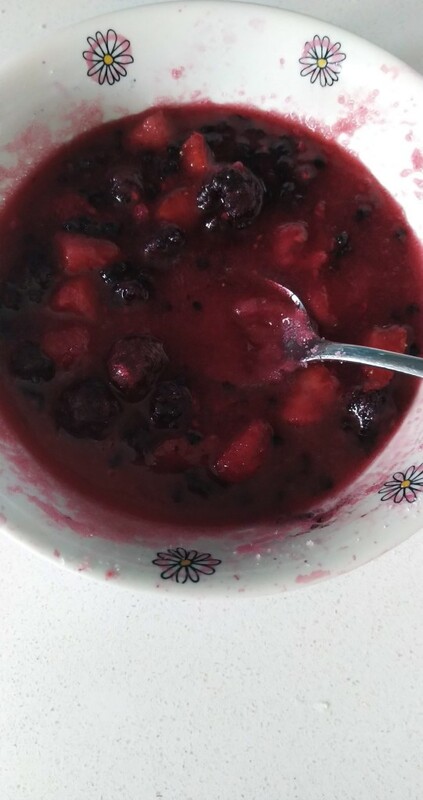 Put the remaining 75g fruit into a bowl with the granulated sugar. Stir in 1 tablespoon of the citrus juice first with a fork, mashing a little of the fruit as you go. If it’s a bit dry, add a splash more juice and spoon over the cake. 6) Leave in the tin until the cake is cool and the topping is set and crisp.